Brigadier General Sani Usman, the Director of Army Public Relations, has announced his voluntary retirement from the Nigerian Army. The Army spokesman made the disclosure in a statement on Thursday, February 7. 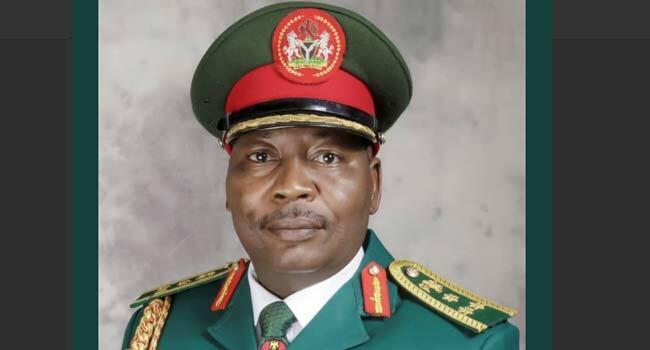 “I am leaving highly fulfilled after contributing my best to national development, the Nigerian Army, gaining great wealth of knowledge, experience, inestimable network of friends which I will treasure forever” the outgoing DAPR said. Usman noted that while an official replacement has not been made by the Force, he will be handing over his role as army spokesman to Colonel A.A Yusuf, the Chief of Staff, Directorate of Army Public Relations. The Army confirmed the development some posts via its official social media pages where Brig Gen Usman’s full statement was published. With utmost gratitude to God, I wish to inform you, the wonderful Officers, Soldiers and Civilian Staff of the Directorate of Army Public Relations, that with effect from Friday 8 February 2019, I will be proceeding on Terminal Leave, thus marking the end of my exciting and fulfilling career in the Nigerian Army. I am therefore bidding you all goodbye in my capacity as Director, Army Public Relations. I would like seize this opportunity to thank you all for your friendship, love, support, loyalty and encouragement over the years that tremendously assisted me personally and re-positioning the Directorate to the enviable height attained, thus far. I also wish to thank the Nigerian nation and the Nigerian Army for the wonderful opportunity to serve the country and humanity in various capacities for over three decades. I am leaving highly fulfilled after contributing my best to national development, the Nigerian Army, gaining great wealth of knowledge, experience, inestimable network of friends which I will treasure forever. I am thankful to the Nigerian Army for giving me wonderful opportunities and work exposure to practice Public Relations to the point of being a Fellow of the prestigious Nigerian Institute of Public Relations (FNIPR), Member of the National Institute (mni), among other honours, awards and qualifications, as well as attaining the highest level of command of the Directorate of Army Public Relations twice. Although a new Director has not been appointed yet, I am handing over to Colonel AA Yusuf, the Chief of Staff, Directorate of Army Public Relations. As I exit this noble profession voluntarily, I wish you all continued fruitful years of service and God’s blessings, guidance and protection, amen. I will certainly miss you all and will continue to cherish the friendship and bond among us.